This annual meeting always means an ultra-early start for many anglers and this year I heard talk of 4.00 am but even this becomes acceptable on a glorious day with wall to wall sunshine, little wind and the expectation of the magic that is the River Test. The dry conditions meant no hold-ups on the motorways and just after 8.30 in the morning I shepherded the last of the 21 participants through the gate and joined them to tackle up. To my surprise one Brown Trout had already been landed and returned by one of the early arrivals so the signs were even better for a good day ahead. The river rises at Ashe and is always in full flow on our beats as it has only a short stretch to go before joining the River Itchen and flowing into Southampton Water, a total distance of 40 miles and we have the pleasure of fishing both banks for about 2 ½ miles of it. It means that there is plenty of space for everyone and when one does meet up there is always time to stop and swap experiences of flies, etc. On one such occasion I was able to slide my landing net under a beautiful Brown trout as Gerry Overy guided it in. 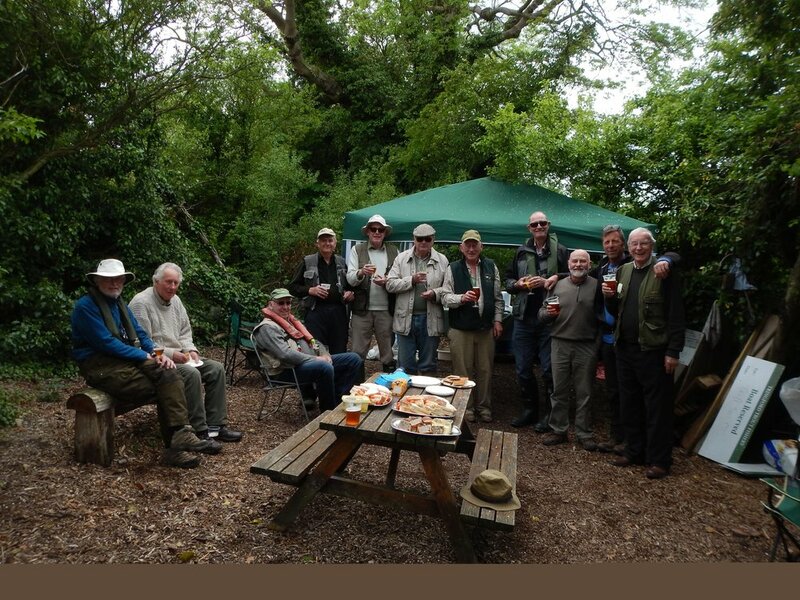 This year about a dozen or more met up for lunch and to hear the usual fishy stories of ones that had been caught, ones that had got away and ones that never came near an angler, as in my case! The general consensus was that it was a superb day with everyone enjoying the ambience as much as the angling. The final news of the day was one of our guests, Ian Hoper, landing a 7lb Salmon and congratulations to him. Our numbers were swelled by members of the MTSFC and I would like to thank every one of them for their support and generous contributions, all of which will go to PICT after paying the Estate. Finally our usual thanks have to go to David Gould who is in charge of negotiations with said body and who makes this annual visit possible. The Monk Trophy is presented annually to the member with the highest weight of fish combined with the number of fish caught over the season and has been won for the third year running by Alan Badcock. Congratulations to Alan who is a stalwart supporter of the Angling Section and very much deserves this award. Largely due to holidays, a rather depleted group of 4 members and 2 guests met at Tringford Lake on a lovely sunny morning, to be met by the smell of bacon and the sizzling of sausages, the usual greeting from Head Bailiff Bob Menzies and his cheerful band of helpers. With our appetites duly satisfied we returned to the car park to tackle up before heading for the rowing punts that make this different from our normal bank fishing. Guests Granville and Chris Ainley took one boat, Alan Badcock and Tony Spicer the second, while Gerry Overy and I shared a boat. It took a bit of getting used to rowing these punts because of their width but with Gerry raising arms windmill fashion to point me in the right direction, we made some progress towards the middle of the lake, where we dropped anchor. Tringford is actually 1 of a number of reservoirs supplying drinking water and is fed from the Grand Union Canal. The water was crystal clear and the bottom was very visible, with only a slight ripple on the surface in the light breeze. The first excitement came to Gerry in the form of a 3” long Perch, not at all what we wanted but a beautiful looking fish nonetheless. Unfortunately this set the pattern for the rest of the day and despite changing flies regularly, type of line once and rowing to other spots several times we could not get a take from the elusive trout. Lunch was traditional Tringford with smoked salmon and egg sandwiches, a huge slab of pork and egg pie plus all the trimmings, followed by a selection of cheeses and grapes and washed down with a choice of beverages. After almost clearing the spread, we returned to our punts for much of the same action as the morning. It was clear that the other two boats had been more successful with each angler catching trout and the final tally was Granville 2, Chris 1, Alan 3, Tony 2 whilst Gerry had 6 Perch of varying sizes and all I could manage was a 2” Perch! We packed up just as the first spots of rain were felt having had a very enjoyable day and a great thanks go to Bob Menzies and crew for making us feel so welcome. Thursday 18th October – River Test, Romsey, Hants. There has to be a considerable amount of organiser’s luck that the second outing of the year brought another beautiful day of glorious sunshine and light winds. Frensham is a very popular venue for our members and their guests, hidden away up a winding track which opens up to five trout lakes and one that is being given over to wildlife, not that there is ever any shortage of that. Our last visit in September showed a number of improvements but this year it was quite spectacular with the lodge now finished. Also the open fronted barn is now sporting a terrace overlooking the main lake with tables and chairs for entertaining. Jillian and her team have really done a remarkable job and I understand there is more planned. Originally there were going to be 11 of us but due to bad backs, bad diaries and gall bladder operations we were reduced to eight of us fishing. When I returned to the car after paying my dues there was a mayfly resting on the boot of the car, which is what every fly fisherman likes to see as this is staple diet of trout at the time of the Mayfly hatch. This one was early but in a couple of weeks time the water should be covered with them and the sight of trout slurping them down. Our day proved to be a bit more difficult and it was some time before the first fish was landed, although several had been hooked only to be lost in the ever-present fight against the angler. We were very pleased to be joined by PICT President, Paul Johnson-Knight, who was happy to watch the so-called experts at work. Fortunately, I was able to hook, play and land a two pounder so that he could see what our sport is all about. Paul was also able to stay for lunch and join in the usual fishing, trade and other banter. This was enjoyed on the new terrace in lovely sunshine. With many a mile to travel home for a lot of us, many had a quick afternoon session before calling it a day. As is so often the case one of our guests out-fished us all by catching four, but with only one member going home with an empty bag, it had been another really good day. The area around the River Blackwater can be wonderful on a warm summer day but with a Siberian wind sweeping across the Essex marshes it can be ‘brass monkeys’ in the Middle of March. In fact the day started with light rain which petered out about 10.30 to leave quite a pleasant day for those of us who chose to fish the more sheltered Home Water. Unfortunately two of our guests chose the deeper and more exposed Priory Water and phrases like ‘never been so cold’ were heard during a break for coffee! I was delighted that 9 intrepid members of the PICT Angling section turned out, including the 2 guests, coming from as far afield as Kent, Sussex, Bucks and Beds. Our last outing was in October last year so there was a lot of catching up chat as we tackled up before setting off to our chosen spots, encouraged by the bending rod of a non PICT angler. Robert Taylor and I chose to move round the lake casting from several different places but didn’t manage to contact any fish at any point. By the time we had circumnavigated the lake and got back to where Alan Badcock was fishing he had already taken three fish. Gerry Overy and David Gould had arrived late after heavy traffic and they too had caught fish, we must have been doing something wrong but the exercise was good and it kept us warm! By lunchtime the weather had brightened and we were able to sit on the lodge verandah to eat our sandwiches and natter about the morning activity or lack thereof. In fact 6 people had caught and only 3 of us reported a blank morning. It was my pleasure to present the Monk Trophy for 2017, to Alan Badcock, the second year in succession that he has won it. The afternoon started on a high for me with three fish in less than 15 minutes, including a superb Brown Trout which was photographed and duly returned to the water. I think I found the right fly because I went on to take 5 in total, which was matched by Alan. I know that the majority had terrible journeys home but judging by the comments I received it seems that the sport compensated for the hold-ups. Many thanks to all who attended and for their donations that will go straight to the PICT charity – the support is much appreciated as an organiser. Our visit to the River Test came in the wake of storm Brian which prompted one or two urgent messages asking if our visit was still on. In the event, the day started drizzly but with light winds and after a couple of hours the drizzle had stopped and we were able to enjoy a reasonable day, with the river running fast and clear as usual. My wife and I had gone down the day before to spend a few nights in our caravan which gives me a head start as our site is only 10 minutes from our meeting point, so I was delighted and not a little surprised to find our President in front of me as I pulled up to the gate at 7.30. Joe Piggott had driven from Birmingham just to see us all set out on our endeavours to catch Brown Trout, then had to leave to an hour or so later to return for a meeting later in the afternoon. It really was a splendid gesture and I am just sorry that he was not able to see any of the action. Talking of action, once again it was rather sporadic, or in my case non-existent! It was the same for my co-organiser David Gould who fishes the river regularly and neither of us caught a fish all day – I put it down to organisers curse!! Elsewhere fish were being caught, but such is the length of the beat , news about catches was not heard until lunchtime when we met up in dribs and drabs to eat our sandwiches and talk about the morning. It turned out that several Brown Trout had been caught and carefully returned. A total of 17 anglers attended, made up of PICT members and guests supplemented as usual by 6 members of MTSFC, which meant that the event was a success and after paying the fishery there was a surplus for PICT funds. I would like to thank everyone who turned out for their support and generosity. This year’s catch was a very good mix consisting of 2 Salmon, 10 Brown Trout, 1 Sea Trout, a metre long Pike, and a decent size Chub,, plus 6 anglers who blanked. Judging by emails I have received it seems that everyone thoroughly enjoyed the day whether they caught or not, which is not only due to the status of the River Test as one of our foremost chalkstreams, but just because the setting is so delightful. My thanks as always to David Gould for organising matters with the fishery and we look forward to the same opportunity next year. For the second year running the MONK TROPHY was won by Alan Badcock, from George Fowler and Dennis Cole. Congratulations to Alan who consistently catches fish at each event and even managed to catch a couple of small fish on the Test. A combination of events, mainly people taking holidays, meant that we had a very meagre turnout for our outing to this delightful fishery at Churt, Surrey. After the usual frustration of the M25, I arrived at 8.30 to find that a lot of work had been carried out since our last visit, with a newly built open fronted barn, housing two barbecues as well as a fireplace, to be used for outdoor entertaining. The old lodge had also been opened up on the first floor and fitted with large tables and chairs, ideal for corporate visits but sadly neither facility was necessary for the five of us who turned up on the day! The weather was ideal, with a gentle ripple on the six lakes, a hazy sun which clouded over later and with fish cruising tantalisingly close to the surface, it seemed we should be in for a good day. However looks can be deceptive and we all found it rather difficult to entice fish to take our flies. Andrew Smith had the first excitement when his Thermos cap bounced three times and disappeared without trace into the lake but had the consolation of being the first of us to see real action when he landed a nice 2lb Rainbow. It was much later that a bailiff suggested using blood worm and after 20 minutes sorting out a terrible tangle and eventually discarding my leader, I managed to catch a super fish on the first cast using a bloodworm made from red rubber! When this happens you automatically think that you have the answer, but not another touch before lunch. We were able to have a brief al fresco lunch with most of us eager to get back to the fishing as we only had half day tickets finishing at 2.00pm. We were joined by Les Bidewell who had set out with the intention to fish, only for his car to let him down and to return to borrow his wife’s car by which time it was too late to do anything other than enjoy the chat and the scenery, not only kingfishers but a couple of Spitfires flying overhead. Our regular guest, Ron Gorin fished through lunch to no avail, but had the excitement of seeing fish following his fly on each cast. In the final half hour, I managed to get a second and saw Alan Badcock catch one, before leaving him to fish out the afternoon – a glutton for punishment obviously! Later, I learned his perseverance had paid off as he caught another two after we had all disappeared. My thanks to everyone who attended, your commitment is really appreciated. Next, it’s on to the River Test which might be even harder fishing!! This was always going to be a new experience for PICT members and it turned out to be one that met with universal acclaim and requests to return to this fishery. Some members may have been put off by the geography, or that boats were involved, but they missed out on a day of good fishing, good camaraderie and to my relief good weather. There had been 34mm of rain during the previous two days but the dawn of a new day brought broken cloud that had virtually cleared by the time I arrived at Tringford. Tony Spicer and Robert Taylor were already there along with Bob Menzies and his tremendous crew of members, a gazebo had been set up, bacon and sausages cooking and a hot coffee thrust into my hand – a good start! Slowly but surely others arrived and after our welcoming breakfast we tackled up and made our way to the jetty where our boats were moored. We had already chosen our boat partners and each boat was allocated a Tringford member to act as ghillie, oarsman and advisor. It wasn’t long before guest Christopher Ainley’s rod was bending into the first fish of the day and for him it was to be the first of many. I missed a pull, but after half an hour connected with a beautiful Rainbow Trout that was incredibly powerful, I managed to get it to the net wielded by our ghillie, Steve. All the fishing was catch and release and the fish was duly dropped back into the water. The day got sunnier and warmer and we changed flies regularly, but apart from a few missed pulls Robert and I did not catch another fish before being rowed to the jetty for lunch, which was a wonderful spread of sandwiches, pork pie and selection of cheeses, accompanied by beer, orange juice or coffee. We had the friendly Tringford members to talk to as well, so the conversations were a lot more varied than usual. By the time we were ready to resume fishing, the clouds were building up, but it was about 3.30pm before it started to drizzle, more fish had been caught and we all sensibly called it a day before getting too wet. It was time to thank Bob and the members who had given us a day to remember and I am sure we will return to Tringford again, hopefully with a few more participants. I am writing this report on the morning of Friday 19th and overnight we have had another 13mm of rain, which is still falling! 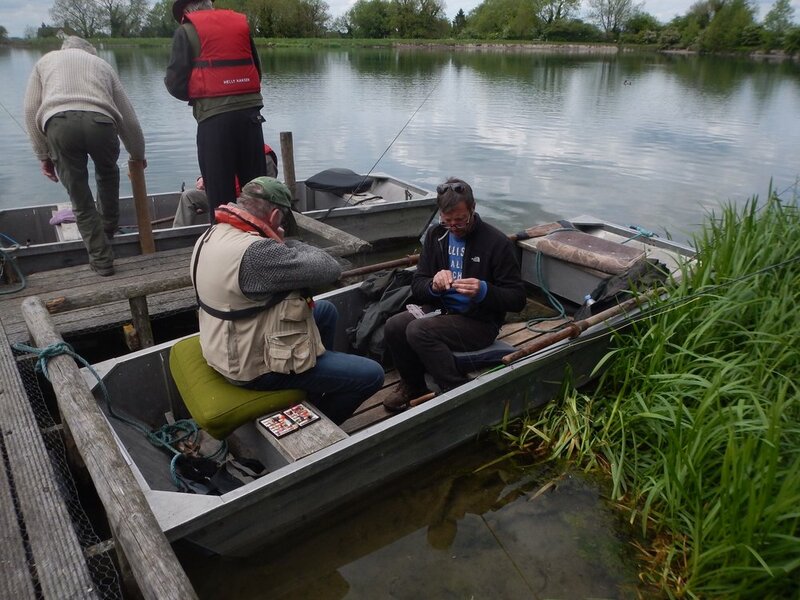 How I managed to find six hours of idyllic fishing weather is truly amazing but the whole experience of Tringford was an organiser’s dream come true. PICT were completely outclassed by our guests, Christopher (13), Granville (7), David Gould (3), yours truly (2) and one apiece for Robert Taylor and Andrew Smith. Tony Spicer ended without getting one to the net after it jumped off, but has the consolation of being in the only action photo taken. Our thanks go to Bob Menzies and the Tringford crew who gave their time voluntarily to make this a special day. There was the usual banter in the car park while we tackled up after which we went off to find our favourite spots on the three lakes that make up the mill complex, which was looking immaculate. I headed for the roadside edge of Mill Pool so that I could greet latecomers and which is an area that often produces a good return but on the day there was a slight algal bloom colouring the water that made things harder than usual. One or two fish were being caught by regulars but it was a long time before the first fish came to my net. Elsewhere it seemed that Willow Pool was the most productive with a few fish also coming out of the Cascade area, but these are smaller waters with limited bank space. The weather was so good that we were able to enjoy an ‘al fresco’ lunch on the terrace, bathed in glorious sunshine. My first task was to present the Monk Trophy to last year’s winner, Alan Badcock. This was followed by a discussion about our next outing to a new venue at Tringford Trout Lakes where we will be fishing from boats. This replaces the scheduled visit to Chigboro. General discussion continued about the paper trade and a range of topics before we all returned to the fray. Despite the good prospects, fishing turned out to be what can only be described as ‘patchy’ and if you found the right patch it was good but otherwise it was quite hard going. Nevertheless everyone caught at least one and Alan showed why he was the new holder of the trophy by catching 3 Rainbow and 3 Brown trout whilst Dennis Cole and guest Granville Ainley caught 5 each. A couple of Blue trout were also caught to add to the mix. The largest fish of the day was caught by guest Russ Ward at 4lb 12oz. All in all it was a very good start to the season and everyone went home having enjoyed a successful day. After a few spots of overnight rain I woke to a fine mild day with light breeze which looked perfect for a day fishing this renowned Hampshire Chalkstream. Although attendance was lower than in previous years, possibly because it was a Monday, the event once again attracted people from as far away as Suffolk, Sussex and Hertfordshire and by 8.30am everyone was busy in the car park sorting out their rods and tackle, eager to start casting a fly on the crystal clear water, the best I think I have seen it. We are fortunate enough to have access to over 2 miles of the river, using both banks, which meant that the 15 anglers were very well spread out after they had gone off to find their favoured spots, making it difficult to hear of any successes. The bush telegraph soon came into operation and I was hearing that fish had been caught, which is a relief to me as an organiser. It was lunchtime before the full picture of the morning’s events became clear with several Grayling and a few Brown Trout having been caught and returned. The hard luck story came from David Gould who managed to hook a good size Salmon only for it to snap the hook, so a case of the one that got away. Our numbers were once again swelled by friends from another charity, MTSFC, and I would like to record a big vote of thanks to them for their continued support and generosity which means that the Angling section can make a small contribution towards PICT. It also became clear that MTSFC completely out-fished PICT on the day and the bare facts are thatwe caught a total of 11 Brown Trout and 22 Grayling, of which just one ½ pound trout was caught by PICT and that by Past President, Alan Badcock. Oh yes there was a lost Salmon but we can’t count that!! My thanks to everyone who supported this event and once again we are all indebted to David Gould who is the rod holder who negotiates with the fishery to get us this unique access to the river. Sadly we lost David Monk this year and an obituary has already been published. He presented the Monk Trophy many years ago in the form of a silver cigarette box which is now awarded to the best angler over all four events during the year, using a complicated formula devised and only understood by myself, but it combines attendance, weight and numbers of fish caught. Despite emails of disbelief the winner this year is Alan Badcock whose ½ pound catch was enough to push me into second place with Dennis Cole third. Congratulations to Alan who has attended all events, caught a good number of fish and may be the first recipient for years who will make good use of a cigarette box! A glorious day for chilling out and relaxing but for the seven of us who turned up at Frensham it was to be a day of hard toil in more ways than one! First there was the M25 to contend with, which was absolutely solid for no apparent reason, then there was the tantalising sight of fish cruising around just under the surface, occasionally coming up to break the surface but very reluctant to take any of our flies. In fact Andrew Smith had landed a lovely fish by the time I finally arrived at 9.00 and wandered round greeting everyone but it was to be another hour or so before another rod was seen bending. This time it was Dennis Cole shortly followed by another for Andrew. As I turned on to the track to the fishing lodge 2 Muntjac Deer were seen disappearing into the undergrowth and fortunately Frensham is a delightful fishery to be aton a lovely, sunny, autumn day and it really doesn’t matter if one is catching fish or not, just being in harmony with nature is pleasure enough. I can probably hear members saying “Oh no it’s not”!! We were delighted to be joined just before lunch by PICT President, Nick Gee, despite his allergy to fish which must surely be almost beyond the call of duty! He knew most of the members so that when we sat down to lunch there was plenty of trade and general chatter. Sitting beside the main lake, under a gazebo with the sun beating down it took willpower to get back to the fishing after our sandwiches had been eaten. As far as I know Dennis Cole had the best catch with 3 Rainbow trout followed by Alan Badcock with 2, but normally we would be catching our limit and then going on to catch and release which shows how difficult it was on the day. Nevertheless it was a super day at a great venue. Our second outing of the year had to be brought forward a day due to a clash of dates at Coltsford, nevertheless we ended with a reasonable turnout of 6 members, 3 guests and were joined at lunch by Les Bidewell. After a spell of sunny weather the forecast was not encouraging, but we managed to get a couple of hours fishing in dry conditions, before spells of light rain set in. Coltsford Mill is a well maintained fishery with three very different areas of water - A series of Cascade Pools, Mill Pool that originally fed the old water wheeland Willow Pool, a smaller lake that followers of these newsletters will know was unfishable last November due to run off from a nearby building site muddying the water. Four of us started fishing Mill Pool and despite trying various swims around the lake, none of us made contact with a trout, although guest Granville Ainley did manage to land a double figure Mirror Carp, so it was time to move to try the other lakes. As I approached Willow Pool I could see three rods bending into fish, all of which were duly landed and rather amazingly Robert Taylor was just completing his 3 fish limit for the day. This is always a problem because unlike many fisheries Coltsford do not allow catch and release, so when you have caught your limit that is the end for the day. However, Robert very magnanimously gave me his successful fly and stayed to oversee my efforts that for some time seemed to go unrewarded. After trying a variety of retrieves I finally connected with a fish which turned out to be the most superb 6lb 10oz Rainbow Trout that Robert netted for me. Meanwhile Alan Badcock and Dennis Cole were both catching steadily at each end of the lake. My day was really made when I hooked a second fish which gave a terrific fight and turned out to be a rare 3lb 15oz Blue Trout. It started to rain, so we adjourned for coffee in the fishing lodge and with two great fish in my bag and other anglers slowly drifting in, the coffee break eventually morphed into lunch. The atmosphere was very convivial and I was the recipient of much pleasant banter about my successful morning! The rain eased off and those who hadn’t caught their quota returned to have another go. It turned out that the fly that had caught five fish in the morning had actually snapped in the mouth of the Blue so I was extremely fortunate to land it at all. A new fly produced another Rainbow for me which was one of the smallest of the day, but I was able to depart a very happy angler. Nearly everyone had caught their limit, the weather hadn’t been too off-putting and a great day was had by all. I can honestly say that anyone who missed this first outing to a new venue for PICT, missed a really super day! Even the weather played its part with the sun shining all day and a light breeze creating a gentle ripple on the water. A rather disappointing total of five members and two guests gathered in the car park to tackle up in anticipation of a good days sport. After tackling up we were shown round the three lakes by the owner, Peter and bailiff John who pointed out the fish holding areas, the underwater features and the method and flies to use. Thornwood Springs has three purpose built lakes, one a large lake stocked with Trout from 2.5lb up, a long narrow lake rather like a wide river with fish from 1.5lb and a series of stalking pools which contain really big fish into double figures. By the time I joined the others on the bank, our two guests had each caught one fish which gave the impression that it might be easy but it turned out to be a challenge all day on all of the lakes. Peter and John spent a lot of time ensuring that everyone caught fish and although it took time to find the right method we all caught fish by the end of the day. A mobile home has recently been kitted out as a spacious lodge with settees, tables and chairs, wood burning stove that was redundant on such a fine day and the all-important coffee and tea making facilities. There was even a microwave oven and my total lack of knowledge of such things caused a certain amount of mirth amongst the others. After the usual natter over lunch I presented the Monk Trophy to Gerry Overy for his efforts last year before we all went back out to catch more rainbows and sun’s rays. Guest Granville Ainley ended up catching 7 while Alan Badcock and yours truly had 4 each. The unanimous feeling was that this was a good fishery for us and most people were very keen to return another time which is always nice to hear as an organiser. I was delighted that 8 members and 3 guests turned out for the last fly-fishing trip of the year, the highest number for 2015, just as I was thinking that interest was waning! It was a very mild day weather wise and quite a pleasant morning under grey cloud, which rather reflected the anglers feelings whenI arrived at 10.00 having picked up Sandy White en route, he is recovering from a stroke in July, but as eager as ever to attend. The reason for the gloom was that not a single fish had been caught by that time and one of the lakes had become virtually unfishable overnight, thought to be as a result of builders pumping out muddy water from footings further upstream. Unfortunately Willow Pool which is usually very productive was more like Brown Windsor Soup! Coltsford consists of Mill Pool and some smaller Cascade pools as well as the aforementioned Willow. There were plenty of fish seen in the Cascades but pulling a fly through them or even dropping one on their nose did not stir any response. So it was that at lunchtime we met in the bar area and only one fish had been caught by Dennis Cole from the Mill Pool. However, this did not stop us enjoying our natter over sandwiches and soon saw people returning to the fray, such is the enthusiasm of our group. Shortly after lunch the weather took a turn for the worse and it started raining so I headed home with Sandy leaving the others to battle not only the fish but the elements as well. Neil and Paul, who run the fishery, did their best to help us in the difficult circumstances, putting more fish into Mill Pool and showing Gerry Overy and his Brother-in-law, Russ, how to catch the fish in the Cascades using a dry fly. It meant that the afternoon was a little more successful than the morning with 5 anglers catching a total of 8 fish even though some rather strange methods had to be employed! Judging by the emails I received just about everyone still enjoyed their day and it being November 5th I suppose one has to expect the odd damp squib from time to time. This year’s winner was Gerry Overy who caught consistently at the three venues at which he fished, only missing out on the River Test, so congratulations to him. Runners up were Alan Badcock, a close second and yours truly a distant third. The Indian summer that we had enjoyed for 10 days, departed about 24 hours before we met for our annual outing to the River Test, nevertheless the weather remained dry but cloudy and reasonably mild for Mid October. The lure of fishing on this iconic Hampshire Chalkstream brought twenty anglers from as far afield as Suffolk and Kent, all of whom arrived by 8.30a.m and were anxious to get tackled up. Fortunately the numbers were once again boosted by members of another fishing charity, MTSFC, because the PICT numbers were sadly very low. By the time I had shepherded them through the gate and joined the party several anglers were already casting a line on the water with early reports of fish being caught so it all sounded very promising. We fish the river for Brown Trout and Grayling using small artificial flies but there is always the possibility of a Sea Trout or even a Salmon being caught. The river was quite high and as fast as ever which means some quick retrieving is called for. It is always encouraging to see fish rising to take insects floating downstream but getting them to accept our artificial offerings is never easy. News of success is not easy to come by because we are spread out over 2miles of bank and so it is nice when we all meet up at lunchtime to swap stories and fishing methods. 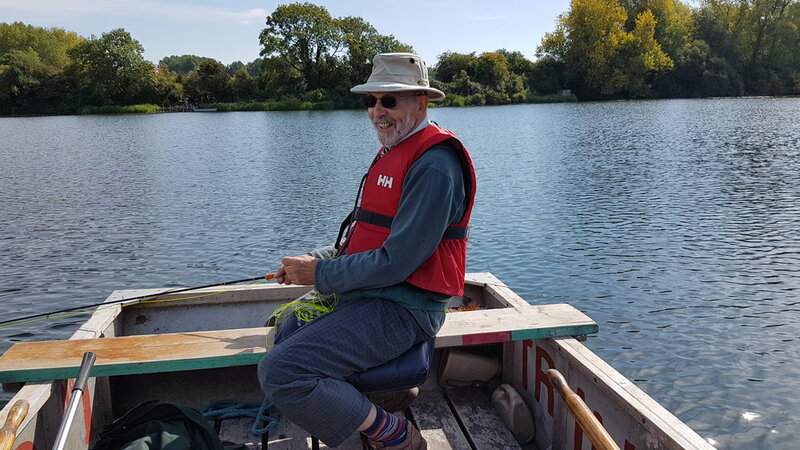 It became clear that a number of fish had been caught including 5 Brownies and 2 Grayling by one of David Gould’s guests and a regular at the fishery. More encouraging was the number caught by newcomers to the river and it seemed to be the regulars who were struggling, including me! Lunch did not last long as everyone was anxious to get back to fishing and another regular, Mike, who had caught 3, offered to show me some good places where fish lie. After another hour and half I decided to call it a day, recording yet another blank day! We ended the day with a total of 19 Brown Trout and 6 Grayling all of which were returned, while several Salmon had been seen jumping though not caught. All in all another very enjoyable day and everyone went home happy and looking forward to next year. Our thanks must go to David Gould who makes all the arrangements with the fishery. I have booked Frensham Lakes for the next meeting, a fishery that seems to be a firm favourite for many of you. Frensham Trout Fishery (Robinswood) consists of 6 lakes in a lovely wooded valley away from the hustle and bustle of everyday life and one that has been very productive over the years. There is a splendid fishing lodge to relax in if the pace of the fishing gets too much for you! Stocked with a variety of trout, Rainbows, Browns and Blues, with fish into double figures (that’s weight, not numbers!) and catch & release allowed, it should appeal to everyone. I hope that as many of you as possible will be able to attend and full details can be found at:- http://www.fishcountryleisure.com. If you catch a couple of fish from one place please move on and let someone else have a go as the lakes do tend to have hot spots. There are outdoor tables and benches so I suggest we bring picnic lunches. If the weather should be bad we can always use the lodge. The fishery is notoriously difficult to find because it does not appear on some Satnav systems and does not have a fishery board outside, in fact the sign states Robinswood. If you need a map or instructions please let me know and I will send details to you. If you know anyone in the trade who has fished or might like to fish please let me know and I will make contact with them. Guests are always very welcome at any of our events; so don’t forget to talk to customers, suppliers and colleagues to spread the word of angling and PICT. I do collect £2 per visit for guests, that goes to the charity. Last visit I had car trouble so I am really looking forward to Frensham in early Summer, I usually aim to arrive about 8.30 and hope to see you all on the day. Because this is a small fishery I need to provide numbers as soon as possible so please let me know whether you will be attending with the name of any guests. David Gould has been in touch with the river keeper and secured the same beats as last year meaning we can fish over 2 miles of double bank. Please make a note of the date NOW and keep it free. Full details nearer the time. NB. For those of you approaching from Guildford and the A3, the Hindhead by-pass tunnel is now open. There are two possibilities 1) leaving the A3 at the Thursley turnoff and making your way through the lanes to Churt, or 2) Driving through the new tunnel and taking the Hindhead turnoff immediately after the tunnel which means you then approach the old A3/A287 junction from the South, turning left to Churt. 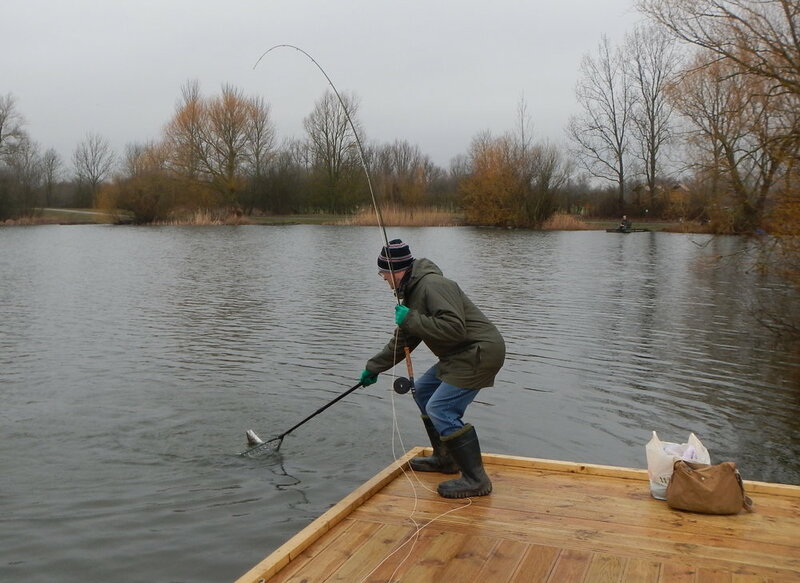 Eight members and one guest met beside Millennium Lake at the Rib Valley Lakes, Ware, on a day that is best described as “raw”, grey cloud and a very chilly wind kept us muffled up all day and some might say that the fish were doing likewise! When I arrived at 8.30, Keith Huxtable and his guest were already fishing and Alan Badcock was tackling up thus showing how keen anglers can be having travelled from Ipswich and Worthing respectively. I like to meet and greet people at our outings so started fishing at the lodge end close to the road ready to intercept those who arrived later. It wasn’t long before I hooked a lively Rainbow Trout which turned out to be a good plateful at just over 2lb – strange that years after the paper industry went metric we are still dealing in good old pounds and ounces. However for a long time it appeared that this was a lucky strike because no other success was being reported, even after handing out my successful fly pattern to other members. Then Alan and David Gould both landed fish but the excitement was short lived as no others were caught before lunch. Fly fishing is very much an individual sport so it is always nice to meet up for a bite to eat at lunchtime and perhaps due to the weather this was the first time I can remember when all the party came together for a natter in the lodge. It was also an opportunity for Alan Badcock, immediate Past President to award the Monk Trophy to Keith Huxtable for his success in 2014. The trophy is won by combining the weight and the number of fish caught over all the years’ outings, hopefully rewarding skill and commitment rather than luck. After our short lunch break several people reported losing fish having hooked them briefly which might be put down to the fact that the fish ‘wise-up’ after being hooked and released back into the lake. Late in the day, Gerry Overy went to the far end of the lake and fishing into the strong wind managed to land 3 and lose another thus showing that determination pays off. Undoubtedly the star on the day was Tony Spicer, a life-long coarse angler who was trying his hand at fly-fishing for only the third time. Using a rubber blood worm he managed to out fish us all by landing three Rainbows, two of which were released back in to the lake. So ended an enjoyable day and hopefully by the next time we meet at Frensham on 21st May it will be a degree or two warmer. Another splendid day at this super venue which was looking at its best with all the banks trimmed, trees cut back and wildflowers beginning to show in the warm Spring sunshine. You see fishing is not just about catching fish but enjoying nature and the pleasure of chatting to like-minded people, especially after a 5 mile tail back to the Dartford crossing! Our numbers were somewhat diminished with 4 people pulling out at the last minute so we ended up with 6 PICT members and 3 guests. When I finally arrived at 9.00 one of our guests Ron Gorin had already caught one and on the far bank Keith Huxtable was playing a lively Rainbow Trout, so things looked promising. After tackling up I made my way to the roadside bank so that I could greet even later arrivals than myself and after a couple of casts saw the line inch out to indicate a gentle take. In this case too gentle as I was unable to set the hook properly and the fish managed to get off. However it was not long before I had another bite and having woken up a bit more I managed to land a nice fish of 3lb 12oz – yes, we haven’t yet followed the trade down the metric path! The morning progressed well with reports of fish being caught on both lakes and the cascade pools and as we were being allowed to fish catch and release for the first time it meant that we could get a couple over our limit which were returned. By lunchtime Keith had had caught 6 and was able to dash off for something called a “business meeting” in the afternoon having left home at 5.00am. Six of us adjourned to the bar to eat our sandwiches and mull over the proceedings of the morning which all agreed had been very enjoyable. I presented Robert Taylor with the Monk Trophy for the second year running – congratulations to him for his consistent catching. We returned to “work” after lunch and with a few spots of rain about I caught my final fish before departing for the day. Apparently it took Gerry Overy a bit longer to get his three but they included one over 4lb and it is remarkable how often he manages to find the bigger fish. Martin Fagan and guest Granville Ainley both had 5 apiece and Sandy White, 1 and several misses. So ended a very enjoyable day when the weather had been very kind to us and the fish very co-operative, leaving everyone looking forward to the next outing. It was great to see a new face at one of our fly-fishing outings and much needed it was too as the final turn-out was just 3 members and 1 guest. Tony Spicer has been an ardent coarse fisherman for years but has recently “invested” in a fly rod. He and I had enjoyed a preliminary skirmish to Rib Valley where he managed to hook and land a Rainbow Trout on only his third cast but as we later discovered there is such a thing as “beginner’s luck”! Unfortunately the weather at Chigboro was not ideal for casting a delicate fly on the water and whilst it remained dry and mild, the wind built up during the day to epic proportions after lunch. I have never had to remove so many flies from various parts of my clothing! The water was crystal clear, there was a good ripple, fish were topping the surface and apart from the dreaded wind, it looked as though it should be a good day but in the event the fish just didn’t want to know about any of our flies. Robert Taylor, winner of the Monk Trophy for the last two years and guest Granville Ainley were unable to connect with a fish so it was bad luck that Tony decided to make his PICT debut on such a poor day. I managed to entice one 2lb trout which was obviously too stupid to ignore my offering so at least one of us went home with a fish. We were able to sit outside in the shelter of the lodge and enjoy our picnic lunch and to have a good old natter which was most enjoyable and it wasn’t long before we were back out to brave the wind but by 3.00p.m we all decided “enough was enough” and said our farewells. As we joined the A12 to make our way home, the sky blackened and we ran through heavy rain which didn’t last long. However when I got home on dry roads I found that my wife had been fighting a torrent of water being blown under the front door and my rain gauge had recorded 13mm of rain during the day so although it had not been the fishing we were hoping for, maybe some luck had been with us after all. As an organiser I can only hope that you have the forward dates in your diaries and that we have a better turnout for these autumn meetings. The morning dawned bright and clear and with temperatures well above normal for the time of year, the prospects for a good day’s fishing looked really excellent. Our annual outing to the River Test, one of the outstanding chalk streams in the country, is always very popular and this year we had access to the whole stretch of river below Broadlands which gave us about 3 miles of double bank fishing for trout, grayling and anything else that might fancy an artificial fly! When I arrived just before 8.00 a.m. there were already three early birds waiting at the gate and by 8.50 the remainder of the 21 anglers had arrived and I was able to join them in the car park to tackle up. A lot of people decided to try the stretch of river that we had not fished before with a few making their way back to the familiar old stretch. We were delighted to have the PICT President, Alan Badcock, in attendance. He had been presented with a fly rod and reel when he retired and was determined to take up the challenge that is the River Test. Such is the appeal of this venue that we were also pleased to welcome another new member, Nick Boyle, who had travelled all the way from Yorkshire to be there. As always, our numbers were swelled by guests including a number from the MTSFC, nice to see one charity supporting another. Despite its popularity, the fishing is always very challenging but slowly news filtered along the bank that the first Brown Trout had been caught and returned as is standard practice. I managed to raise two very small fish that jumped after the fly as I lifted off, a classic case of bad fishing! River angling tends to be a rather solitary sport so it was good to see most people meet up at lunchtime to discuss tactics and generally have a good old natter, made even more pleasurable by the very mild climate. The general feeling appeared to be that heavy flies weighed down with a tungsten bead were the ones to use and a guest, Bill, managed to land a grand total of seven trout during the day. However just to show how perverse fishing can be three of my guests spent the afternoon using small dry flies and not only had some success but a lot of fun casting to rising fish. Thus ended another super day with a good turnout, a good number of fish caught, good weather and happy faces all round leading to a surplus going to the PICT charity. My thanks to David Gould for making the arrangements with the fishery and to all participants who made it such a successful day. Clear skies brought the first frost of the autumn indicating the prospects of a fine days fishing once the hard ice had been cleared from the car windscreen. With a good turnout of 13 members and guests I was really looking forward to returning to what is one of my favourite trout fisheries with its 6 small to medium lakes and abundance of hard fighting fish. Sadly it was not to be for after starting my car without problem, I had only gone a few hundred yards when it started misfiring badly, a very intermittent problem had suddenly become very severe. I drove for several miles hoping it would clear itself but no luck so after half an hour I was back home waiting until 8.30 before phoning the fishery and one or two members, so this report is written ‘in absentia’. Keith Huxtable returned my call and had already landed 3 good fish and reported that others were also catching thus increasing my frustration at not being part of the action. Dennis Cole also made a successful start to the day and had 3 fish by 9.45 but found it more difficult as the wind increased bringing down lots of leaves, the bane of an anglers life. In contrast to this Andrew Smith and his guest did not catch anything until the afternoon but then had a couple of fish weighing 3.5 and 4lb respectively. President Alan Badcock caught his first PICT fish on only his second outing with us, sorry I wasn’t there to witness it. Gerry Overy fought his way through the traffic but after a mid-morning start managed to net three by lunch which he tells me was the usual sociable event. Robert Taylor usually gets himself into the photos due to his success in winning the Monk Trophy for the past two years, this time he was grateful that I wasn’t present with the camera as he somehow ended up in a bog up to his waist!!! After two remarkably successful days at Coltsford Mill and Frensham the clear winner of the the trophy for this year is Keith Huxtable- congratulations from all the angling section. Gerry Overy and Robert Taylor ended up in 2nd and 3rd places. All in all it has been another successful year with some good turnouts and it was very nice to see some new faces at our 4 events of the year. Everyone has to travel a long way to get to the venues which I try and spread around geographically as much as possible so thanks to you all for your support.